Coolray Field Ticket Office will be open from 10 a.m. to 2 p.m.
LAWRENCEVILLE, GA - Gwinnett Braves individual game tickets for the 2017 season will go on sale to the public on Saturday, March 11. The Coolray Field Ticket Office will be open that day for individual game purchases from 10 a.m. to 2 p.m. Fans can also purchase G-Braves merchandise at the Coolray Field Team Store beginning at 10 a.m. Starting March 11, individual game tickets may also be purchased by calling 678-277-0340 during regular Ticket Office hours (Monday-Friday, 9 a.m. to 5 p.m.) and at any time online at GwinnettBraves.com/tickets. 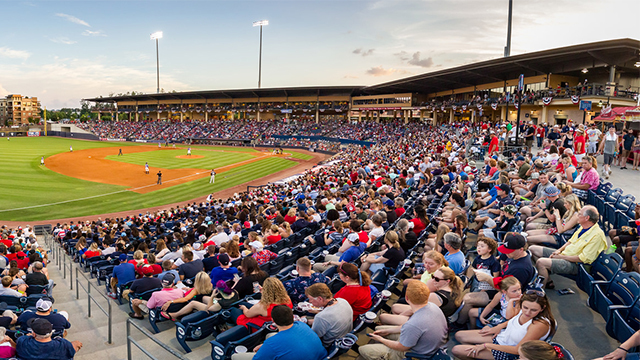 The Gwinnett Braves open the 2017 season at Coolray Field on Thursday, April 6 with a 7:05 p.m. game against the Durham Bulls. Visit GwinnettBraves.com for the full 2017 schedule, as well as the 2017 Promotional Schedule.